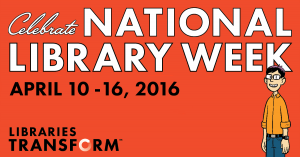 This week is National Library Week, April 10-16, a time to celebrate the contributions of our nation’s libraries and librarians and to promote library use and support. Whether you’re a “regular” or haven’t been in the library in a LONG time, stop by your favorite library branch and say hello! We’d love to know: What makes the library special to you? Do you remember going to story time or perhaps taking your children and grandchildren? Did you find “just what you were looking for” or discover something new? Perhaps someone encouraged you, shared a favorite author, musician, game with you or found information for a school report, business venture or… ? One of my favorite experiences as a librarian involved an older woman and young girl who stepped up to me, obviously excited and celebrating something. The girl was bubbling over with anticipation and infectious happiness. I was delighted when the woman introduced me to her granddaughter and said, “Today is her birthday and she asked for her own library card.” I told her about her new card and she very carefully printed her name on it and then twirled around skipping to the children’s section to select her books. That’s one reason I am proud and happy to be a Mesa County Libraries librarian. Posted in Branches, General, Virtual Branch.